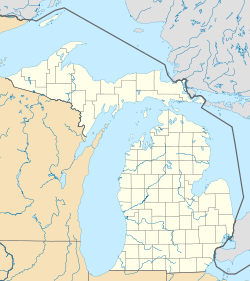 Ontonagon (/ˌɒntəˈnɑːɡən/ ON-tə-NAH-gən) is a village in the U.S. state of Michigan. The population was 1,494 at the 2010 census. It is the county seat of Ontonagon County. The village is located within Ontonagon Township, at the mouth of the Ontonagon River on Lake Superior. Industry was centered on the Smurfit-Stone Container production facility at the river mouth until the plant closed in 2010. According to the United States Census Bureau, the village has a total area of 3.86 square miles (10.00 km2), of which, 3.71 square miles (9.61 km2) of it is land and 0.15 square miles (0.39 km2) is water. Ontonagon is the westernmost incorporated community in the United States in the legally designated Eastern Time Zone as determined by the United States Department of Transportation. In the summer the sun sets over Lake Superior at 10 p.m. local time with dusk lasting until almost 11 p.m. By contrast in the winter the sun does not rise until just before 9 a.m. and it is still pitch black at 8 a.m. Ontonagon is within one degree of longitude to the east of the 90th meridian west, which is actually the meridian for the Central Time Zone. Therefore, Ontonagon is geographically situated in the Central Time Zone, not the Eastern Time Zone. As a result of this idiosyncrasy, Ontonagon actually has its solar noon occur either at or near 1 p.m. during the winter when standard time (EST) is being observed and 2 p.m. when daylight saving time (EDT) is being observed. The same is true for solar midnight, which occurs at or near 1 a.m. while on standard time and 2 a.m. while on daylight saving time. The former swing bridge over the Ontonagon River in Ontonagon (now removed). The village is served by the Ontonagon County Airport (KOGM). As of the census of 2010, there were 1,494 people, 717 households, and 390 families residing in the village. The population density was 402.7 inhabitants per square mile (155.5/km2). There were 910 housing units at an average density of 245.3 per square mile (94.7/km2). The racial makeup of the village was 97.3% White, 0.1% African American, 0.7% Native American, 0.3% Asian, 0.2% from other races, and 1.5% from two or more races. Hispanic or Latino of any race were 1.2% of the population. There were 717 households of which 19.7% had children under the age of 18 living with them, 40.9% were married couples living together, 9.6% had a female householder with no husband present, 3.9% had a male householder with no wife present, and 45.6% were non-families. 41.1% of all households were made up of individuals and 19.3% had someone living alone who was 65 years of age or older. The average household size was 1.99 and the average family size was 2.66. The median age in the village was 51.1 years. 17.6% of residents were under the age of 18; 5.1% were between the ages of 18 and 24; 18.5% were from 25 to 44; 33.3% were from 45 to 64; and 25.5% were 65 years of age or older. The gender makeup of the village was 48.9% male and 51.1% female. At the census of 2000 there were 1,769 people, 768 households, and 450 families living in the village. The population density was 182.1/square kilometre; (472.0/square mile). There were 891 housing units at an average density of 91.7/square kilometre (237.7/square mile). The racial makeup of the village was 97.68% White, 0.00% African American, 0.73% Native American, 0.23% Asian, 0.00% Pacific Islander, 0.28% from other races, and 1.07% from two or more races. 0.85% of the population were Hispanic or Latino of any race. 25.9% were of Finnish, 20.6% German, 7.4% Polish, 6.4% French. 5.8% English and 5.6% Irish ancestry according to Census 2000. There were 768 households, of which 24.3% had children under the age of 18 living with them, 45.3% were married couples living together, 8.6% had a female householder with no husband present, and 41.4% were non-families. 37.9% of all households were made up of individuals and 19.8% had someone living alone who was 65 years of age or older. The average household size was 2.11 and the average family size was 2.76. In the village, the population was spread out with 20.5% under the age of 18, 4.2% from 18 to 24, 23.0% from 25 to 44, 25.0% from 45 to 64, and 27.2% who were 65 years of age or older. The median age was 47 years. For every 100 females, there were 91.7 males. For every 100 females aged 18 and over, there were 88.1 males. The median income for a household in the village was $28,300, and the median income for a family was $35,804. Males had a median income of $36,964 versus $20,815 for females. The per capita income for the village was $16,293. 11.8% of the population and 6.5% of families were below the poverty line. 15.1% of those under the age of 18 and 10.0% of those 65 and older were living below the poverty line. This climatic region is typified by large seasonal temperature differences, with warm to hot (and often humid) summers and cold (sometimes severely cold) winters. According to the Köppen Climate Classification system, Ontonagon has a humid continental climate, abbreviated "Dfb" on climate maps.